The Prince George Spruce Kings will visit the South Surrey Arena for the first time this season when they face the Surrey Eagles this evening. It's the first of eight games between the teams which is a big change seeing as they only met once in the 2011-12 campaign. In that game, the Birds triumphed 2-1 on December 18 of last year. The Eagles are coming off last Sunday's double overtime loss to Chilliwack and sit in fourth in the Mainland Division with a record of 4-3-0-1. Despite dropping the game to the Chiefs, Surrey picked up three of a possible four points last weekend. However, the Birds have struggled on the power play of late, failing to convert on their last 25 opportunities with a man advantage. "At the end of the day it comes back down to hard work," said head coach and GM Matt Erhart of the power play problems. "I think we were getting outworked for loose pucks, and guys were kind of waiting for the puck to get to them instead of attacking for the puck. When we do get the puck, we need to be more aggressive and attack seams and put the pressure on the penalty kill to kill the penalty and not just sit back and let us kill the penalty for them." After picking up points in their first six games of the season, the Spruce Kings enter tonight's action looking to bump a two game losing skid, following losses in Merritt and Penticton last weekend. 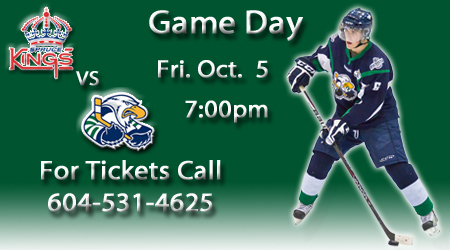 Tonight's game is only the second divisional match-up for Prince George this year while the Eagles have already faced opponents from the Mainland Division four times. New addition Cam Lawson, who joined the Spruce Kings from Victoria in the trade that saw the Fitzgerald triplets shipped to the island, leads the team in goals with five. Prince George currently sits in second in the Mainland Division with a 4-2-1-1 record, leaving them only two points back of Coquitlam.